In 1-gallon resealable food storage plastic bag, combine all ingredients except cod; mix well. Add cod; seal bag and turn to coat. Refrigerate 30 minutes to marinate. Heat oven to 425°F. Line 15x10x1-inch baking pan with foil. Place cod in foil-lined pan. Discard plastic bag and marinade. Bake at 425°F. for 10 to 15 minutes or until fish flakes easily with fork. Choose gingerroot with firm, slightly shiny skin. Avoid roots with mold or shriveled skin. For the best flavor, use full-flavored Japanese soy sauce. Fish has fragile flesh that absorbs flavors quickly and does not need to marinate for long. 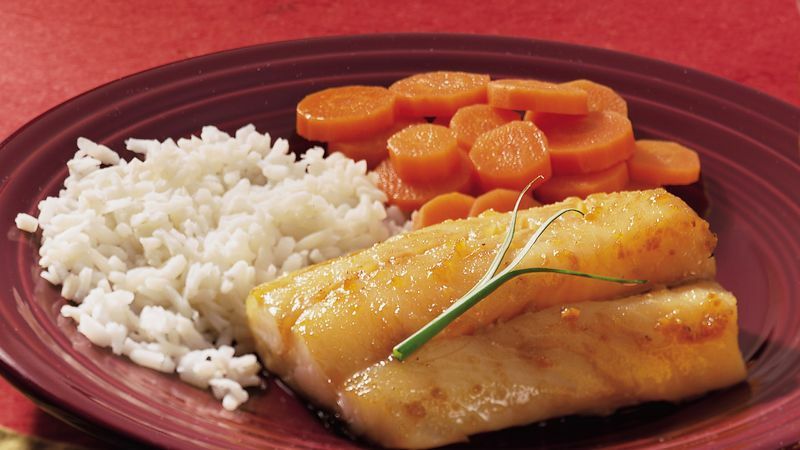 Acidic ingredients such as lemon juice and vinegar alter the texture of fish after an hour.